Treasury secretary Jack Lew revamped his signature to make it more legible. 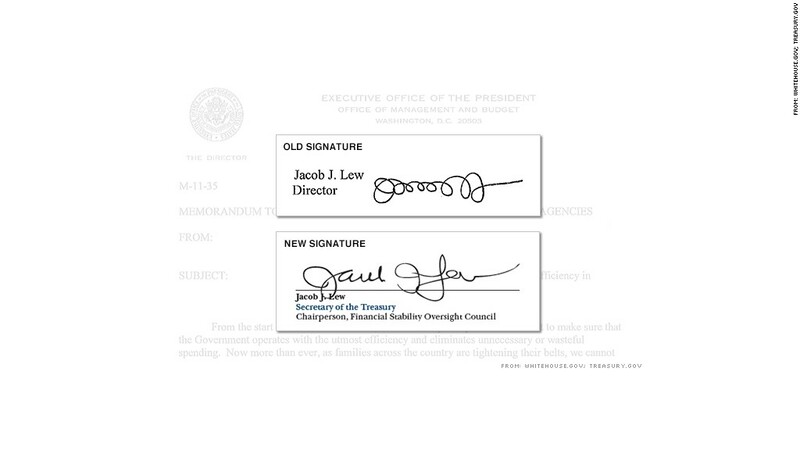 Treasury Secretary Jack Lew's signature has a new look. Lew debuted a sparkly new, mostly legible John Hancock on a financial report issued by the U.S. Treasury last month. Gone are the connected loops and lines that bore no resemblance to his name that the media, and even President Obama, mocked when he was nominated to the post in January. The revamped version, which appeared on an annual report from the Financial Stability Oversight Council, definitively spells out his first name, middle initial and last name. The Treasury secretary's signature garners a lot of attention, since it is required on each currency note in order to make it legal tender. It graces the lower right-hand side of each printed bill. Treasury secretaries in the past have had to clean up their writing acts. In fact, it's common practice for them to refine their signatures. Former Treasury Secretary Tim Geithner told Marketplace last year that he had to change his signature when he submitted it to the Bureau of Printing and Engraving for currency notes. "I had to write something where people could read my name," he said in the interview. The U.S. Treasury wouldn't say when new bills with Lew's new signature would be available. The process of transferring a new secretary's signatures into bills can take months. After receiving signatures from the new secretary and the new treasurer, the bureau creates a series of bills with new serial numbers and suffix letters. A new plate has to be designed before printing the bills.